I’ve started riding again after letting my hamies rest for a week and I couldn’t wait to get on the RedLine 925. For her maiden voyage I took the 925 to work. This was my first experience riding a fixed gear bike. It took me a few miles to get used to the constant pedaling. Learning how to slow down and completely stop without brakes took about 18 miles to learn. This is a shot of the 925 in my office. This is at some office park on my way home. 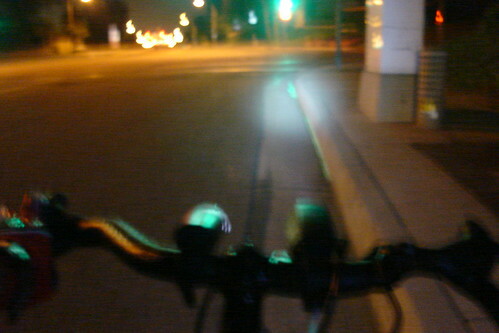 I even went on a night ride. I made sure I had enough lights. After riding the RedLine 925 for almost 40 miles, the 925 has been performing like a champ. I haven’t experienced any flexing of the frame. The only thing I’ve had to do was replace the stock stem with one that had a higher angle. I prefer to ride my bikes with a comfort geometry rather than a race set up. I’ve noticed that the bikes you feature here as “commuter bikes” and that you mention int the blog are all… big. I mean, there’s no folding bikes (besides Swift and Paratrooper). I guess that has to do with the kind of area you guys live in. I have a hybrid 26″ bike, and recently i bought a really great folding bike: Genius by Mobiky (www.mobiky.fr). It’s a french design but it’s already available in the US too in http://www.mobikyusa.com. I found out about it in April through popgadget.com and i fell in love. Because of it i decided to set up a company just to be able to make it available in my country. I find it really really beautiful and extremely ingenious. I’d like to find other people who own one and know what they think and feel about it. We haven’t been able to get our hands on other foldable bikes other than the ones we’ve tested. But I’ll definitely look in to reviewing the Mobiky. What brand of stem did you purchase for the Redline 925, and what is its angle? I replaced it with a 50 mm Bontrager stem that I had on my old Gary Fisher Tarpon. As far as the angle, not quite sure. The 925 has been unbelievable in San Francisco for me. And the fixed gear that I thought might limit me has been the oppisite. I just put a deposit down on a new 925. I’ve been commuting to work (10 miles RT) for about three years; good weather on my Fuji Newest and bad weather on a rattle-trap, rusty old mountain bike I bought for $50 years from a community bike-rehab center. We’ve had lots of wet and cold weather lately here in Indianapolis, and I’ve gotten so fed up with the rustbucket that I’m suppressing my tightwad nature and splurging on the 925. I test rode one (in freewheel mode) a few weeks ago and loved it; research on the web seemed to back up the choice, so I phoned in the deposit yesterday. Can’t wait to pick it up next Thursday! I’ve never ridden fixed gear (unless you count Spinning classes! ), so that’s an exciting new area I’m looking forward to trying. I’ll keep you posted. I just rode a Redline 925 afew hours ago, as i am searching for a first step back into bikes (its been years since i rode a bike, and they were always cheapo $80 target bikes). i was highly skeptical about riding a singlespeed, but after taking it around the neighborhood near the shop, i was sold. now i dont know if i could go back to a multispeed, it just feels chunky. the bike was solid, rode well, and the gearing was neither too high or low. i am definetley interested in getting it into fixed gear mode and see what thats like. It’s so great to see everyone raving about their 925s. I’ve had mine since September and ridden it to work nearly every day. I love it and it makes my life so much better in so many ways! It is an awesome bike. I did a duathlon on it last fall and flew by some guys on carbon bikes (flat course). I remember thinking thsi bike was killer after test riding, but I didnt like being so forward. Leaning over the front made me feel uncomfortable. Even on one with standard drops the LBS set up. Would a stem and bars help? I would prefer nto hanging over the front wheel and being more upright. There are a lot of neat fixies in my area with all types of simple small bars as well. Likely these set ups would not be the better choice for me either if less racey seems to be more my interest. I like what I hear about the 925 so far, but the handlebars are something I have never tried before. I am comparing the 925 to the Bianchi San Jose (bummer no fixed gear) and the Kona Paddy Wagon. Does anybody have any info on these bikes that might help with my decision? Such a fun bike…wish the Geometry wasnt so tight. Is the San Jose (albeit not a fixie) less confined to the bars? Paddy Wagon? I would love a gearless road bike bike. Looks wise, the 925 wins hands down for me. I like the controversial leopard print seat on the San Jose as well though. My home town representin’ to! I would like ot sit on the bike either more upright, or less away from the bars…kind of like my old mid 80’s Peugeot basic Carbolite 103 10 spd was. Sean: I’ve been riding my 925 for awhile now and love the mustache handlebars. Multiple hand positions and plenty of leverage for standing up and smashing the pedals. As far as comparing between the 925, paddy wagon and san jose… it’s pretty much a toss up as the price points are very similar and all three companies have a good reputation. I will say that I like having the fenders on the 925 and I’ll never go back from fixed gear. Any thought on this compariso. Crank length is not given but I hear it is very important for fixed riding. Hope to make my decision soon when I can ride them. Seat clamp	Kona Clamp	?	? Head tube	16.5cm	?	? BB height	28.7cm	26.9	? Sorry for the bad post. I lined all the figures up perfectly before submitting. Have you considered reviewing the Giant Bowery? I own one and I love it. I ride it fixed as my daily commuter and I have been doing so for about 8 months. 20 miles round trip 5 or 6 days a week and I have not had a single problem aside from one flat tire which I changed quickly. It handles really well and the frame seems as if it could survive a nuclear winter. Have you guys over here ridden one? Has anyone fitted a chain guard on a 925. I sometimes have to ride into work wearing street clothes and dont want that black racing stripe on my leg. any ideas? What happeed to the chain guard that came with the bike? I have not seen any other 925’s fitted with anything other than the stock one. I just picked up my 925 yesterday and I love it! I haven’t tried it fixed yet. After doing a short ride last night and a longer one today, I had to fit it with a set of drops. The mustache bars had to go. I liked the look of them but they just didn’t work for me. This is my first road bike. This site is one of the reasons I decided to go with Redline. I purchased a Monocog 29er a little over a month ago and just love it as well. That’s another reason I chose Redline. As for the Monocog, I don’t quite understand why it came with such a large 20 tooth cog. I had to wait a week for my bike shop to get in some smaller ones. After trying out a 16t, 17t and 18t, I’m going to stick with the 17t for the most part. Overall, the bikes seem to be made well and at a decent price. I’m sure I will upgrade most of the components eventually, but no real reason to just yet. What do you use to carry your business stuff? Is it easy to add a rack to this bike, I notice there are no brazeons for it. Andy – If you’d like the chainguard that came on my 925. I can ship it to you. I have no use for it. Got my 925 last Wednesday. 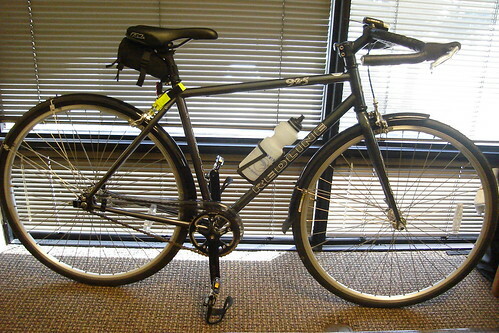 It’s still @ work as I’m building it up w/some Nitto RB-021 pursuit bars and TT brake levers. Should have the bits by tomorrow so I should be riding it by next week. Mike – Look closely @ the seat stay (just below the yellow thingy in the first pic), there are braze-on’s for a rear rack on the frame. Well I have 70 miles on my 925 and after 30 miles I ditched the moustache bars and got some straight mountain bike bars, mountain bike brake levers, brake cables and grips for $50. Feels much better now though a bit tight…may consider a longer stem in another 100 miles or so. I have noticed a strange clackity clackity clack noise from the rear wheel…..anybody else hear rear wheel noises? I just wanted to get back to you with regard to your offer of chain cover — I’d love to take you up on it, actually! Give me an email at andy(at)sheats(dot)org. 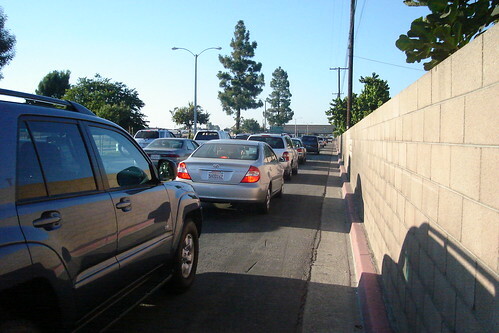 Steve, I picked up my Redline earlier this week and on my first commute I heard what I would describe as a strange clackity noise. I was trying to figure out if it was from the crank or rear wheel. Only does it when I’m really standing on it though. Figured out what it was yet? Jim, I switched to the fixed gear today and the noise is gone. I think the noise is related to the freewheel. Man the fixed gear takes time to get used to for sure. 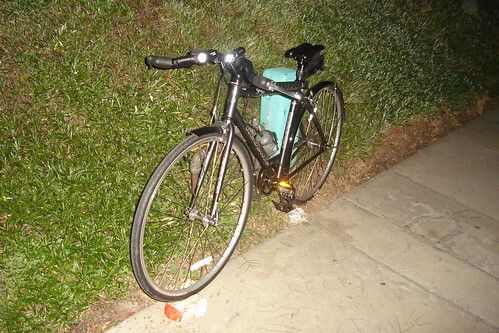 I kept telling myselg “keep pedaling…keep pedaling…..but automatically tried to coast when cars got too close or I slowed down to stop…..I better take it slow for a while. Another suggestion, have your lock ring tightened on your fixed cog before you ride…mine was very loose. I took it to a local bike shop and they tightend it and ordered me the tool to do it myself. Getting the chain at the correct tightness and the wheel straight in the dropouts is challenging too as I am used to just pulling the wheel all the way back and clamping the quick release on my other bikes. Cool, thanks. I think I’ll just keep an eye on the freewheel or mention it to the shop since technically its under warranty. Not planning on going fixed, maybe this winter I’ll give it a try. Yeah, getting the wheel straight is tough, I just count the threads on the tensioners and that gets me pretty close most of the time. I have a 925 and have had other single speeds. I highly recommend the replacement of the junk standard freewheel with a White Industries sealed bearing freewheel (I like the 17t Trials Model). Most freewheels are junk, hence the noise others are hearing, the White Industries is expensive ~$90.00, but rebuildable and beautifully made. It is available in other tooth sizes also. Check other comments on the internet. Cannot be beat. i was planning on replacing it. I don’t get the sizes though. The free wheel says MAIN DRIVE 1/2 x 8/32. What do those 2 numbers mean? Anybody remove the 925 seat post yet….man it is a yard long. I didn’t even realize there where marks on the post to adjust seat height. All the numbers on my post are in the seat tube….who puts their seat high enough to use the number marks????? I had noise too but since I flipped the hub I have been silent. I freaking LOVE this bike. I have 4 bikes and all my others have been collecting dust as I always opt to ride fixed. Will I ever tire of the fixed gear? I rode fixed for 1200 miles but quickly went back to free wheel side during the rainy season. Freewheel still makes noise when pedaling…I need to get a new one. 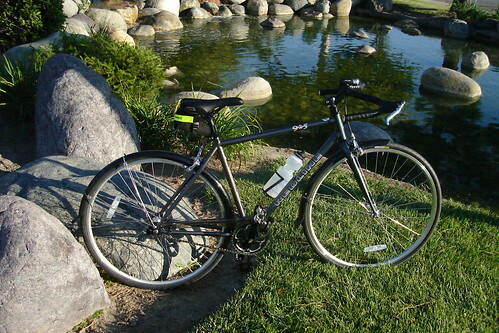 I love the 925…I bought it on a whim, when it was priced to sell for $350 @ my LBS. I ditched the chainguard immediately and will remove the fenders when I go back in for the free tune-up (how much rain do ya think we get in Tucson anyway?). As much as I love the style of the moustache bars, this is my first road bike and I just can’t seem to get comfortable with the geometry and the lack of padding. However, Nashbar sells some gel pads, so I’m thinking of buying some and making some bullhorns…minus the rear brak maybe? Regardless, the bike feels solid and hauls a$$, even though I’m pushing 45! Friday is my commute day here and after my first trek last week, I’m anxiously awaiting the next ride on the 14th!